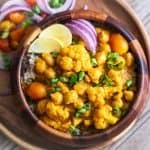 This is a classic cauliflower chickpea coconut curry thats made in one pot and has a simple mix of spices. That sauce is super addictive and you’ll love how easy it is to make. It’s vegan and gluten free, but you can easily add chicken or shrimp if you prefer meat. Heat oil in a pot and add cumin seeds. Once the seeds start spluttering, add garlic, ginger and onions. Saute for 3-4 minutes till the onions start turning slightly brown. Add the tomato puree, turmeric powder, curry powder, chilli powder and salt. Cook for 3-4 minutes till the tomato puree reduces a bit and the whole thing starts looking like a paste. Add cauliflower, chickpeas, cherry tomatoes (if using), water and coconut milk. Bring this to a simmer, and cook on medium heat for 15-20 minutes till the cauliflower is fork tender but hasn’t turned mushy. Taste and adjust salt, and turn off the heat. Top with chopped coriander if you like and serve hot with steamed rice. Fresh tomatoes work well in this curry. Swap the tomato puree for 2 finely chopped tomatoes, but the curry may not be so smooth. I use Bolst’s curry powder for this recipe and I’ve seen it at most super markets.